We wanted to visit Barcelona and got lost into spending tens of hours looking for valid information at Lonely Planet, TripAdvisor and on the Internet. And then, we couldn’t put it all together, to create a perfect plan for visiting Barcelona in 3 Days. 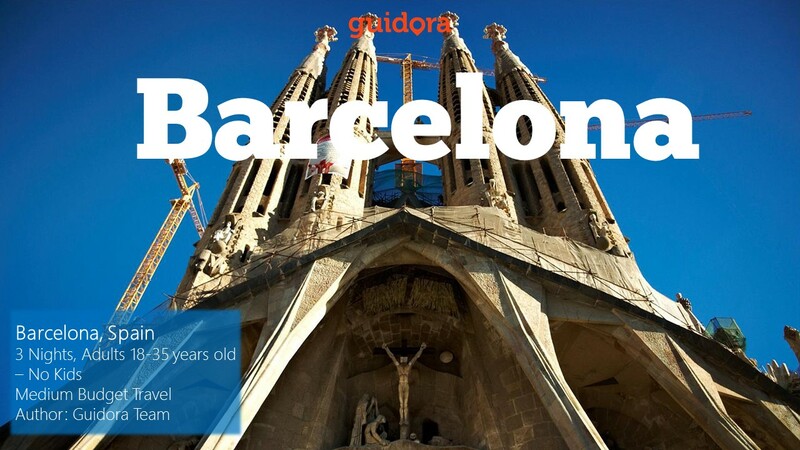 Guidora is the only publishing house building Travel Guides for you, like no other does. We provide exact 72 hour plans with only one and best choice on where to stay, what to eat, what to see. It’s an easy travel path that you just follow and spend the 3 best days of your life in Barcelona! If you are wondering What to Do in 3 Days in Barcelona and What are the Best Things to See, look no further! We have built an excellent 72 hours plan for Barcelona, with information on what to do every hour of the day. All the information provided is by local experts and travel bloggers. Since they live in Barcelona, or travel there often, they know the best that the city has to offer to you. – Exact information on what is the best hotel to stay in Barcelona, so that you will be in the best area of Barcelona for all activities, without breaking the bank. – What dishes to try. A simple culinary guide with the top 10 dishes and drinks. – How to move from the airport to the hotel with the most budget friendly way. – How to transport with bus, tram or metro. Detailed names of the bus numbers and the station names you will use. By getting this guide, you will feel like having your best friend in Barcelona, showing you around. It will save you time and money in a stress-free way. It will help you to enjoy the best days of your life in the magnificent town of Barcelona! Guidora’s Barcelona in 3 Days Travel Guide, is your entry ticket to the most accurate advice on what are the best things to do in Barcelona in 72 hours. It includes a detailed 72-hour plan from the first moment you will arrive in the airport of Barcelona, until the moment you leave this amazing town. -All the Maps are available in Google Maps, to help you navigate Barcelona easy, through your smartphone. -Information in this Barcelona travel guide is up-to-date as of 2016. -Free Bonus Included: 51 Travel Hacks for a Cheaper and Safer Trip. Get this Guide Now and enjoy your trip to Barcelona!